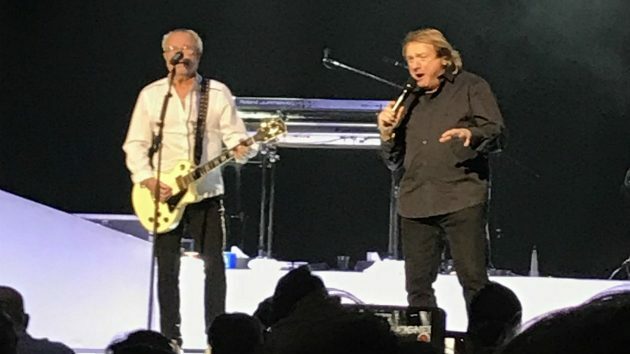 Foreigner guitarist and band leader Mick Jones has reconnected with the group’s original frontman, Lou Gramm, in recent years, including performing together at several special reunion shows in 2017 and 2018. Now the two may soon collaborate on music again. Mick points out, however, that Foreigner has a variety of musical endeavors and projects on its plate, so “it’s just a question of time” whether he and Lou will be able to complete any of the tunes. Jones notes that during the past couple years, the band has recorded live acoustic and orchestral albums, and toured in support of both projects, not to mention playing the reunion gigs, which saw Gramm and other original Foreigner members perform alongside the group’s current lineup. As for Foreigner’s 2019 plans, the band will launch a Canadian trek in February, followed by a series of spring U.S. shows. Foreigner then will head to Europe for a variety of gigs in June and July. The group also has confirmed performances at three U.S. fairs in September. Mick tells ABC Radio that a few Foreigner reunion concerts will be scheduled this year as well.